Happy 20th Anniversary, Harvey ‘Address King’ Meiselman! Harvey Meiselman has started taking advance orders on his 2015 address lists. Drop by his website. Harvey has NINE different lists for sale for this coming year. Anyone ordering before Christmas gets a bonus address list of Hall of Famers from all sports. Why buy now for something weeks away? Harvey is a “first in, first out” guy. You’ll get your order filled immediately. He’ll have new addresses of sometimes-signers. These men may not keep signing. Fill their mailbox first. In other words: competitive edge. Harvey works year-round on the list. Here was an example of a discovery he added to the 2014 list — finding shortstop Harry Chappas. Expect more great detective work in 2015. I’m a long-time customer. Harvey has never stopped collecting. His lists are tops. He is, too. 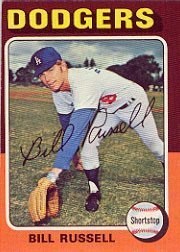 Bill Russell, the Dodgers institution, may not be long for the free-signing world. “This is the only piece of memorabilia that I will sign for you. Please DO NOT send any more items to this address. They will not be signed or returned. He’s signing one-only FOR NOW at his home address. His response times are growing to months. Once, according to www.sportscollectors.net, he was a sure thing for multiples. Russell’s grand total, even with his toughened stance, is still 370 out of 400 recorded TTM contacts. I wouldn’t wait writing to Russell. If you do, don’t send more than one card. I predict dark clouds ahead that will cause him to be a fee signer or another RTS man. Baseball Address 2013 List Ships! Harvey Meiselman has done it again. Although 427 collectors have a headstart on you, it’s not too late. In fact, now’s the best time to order his Baseball Address List. Because of the Jan. 27 U.S. Postal Service rate hike, Harvey has to increase his price to $37 to cover the new expense. Order before Jan. 27 to get the old $35 postage-paid deal. Harvey has all his bases covered. Remember December’s feature about collecting Ford Frick Award honorees? Harvey’s list is the place for all the addresses. To order or learn more, go to http://sportsaddresslists.com/.